While the females and young males of this species wander in small flocks through the forest in search of fruit, young leaves, and insects, the adult male spends much of his time at the "bower." Working near other males, lie claims a small area of the forest floor and erects a narrow avenue of twigs, staining them black with a mixture of charcoal and saliva. He decorates the area with feathers, flowers, and stones, preferably bright blue ones. When a female visits, he woos her with fizzing and chirring notes while exhibiting his brightest objects in his bill. After mating, the female leaves to nest and rear the young alone. • NEST A shallow cup nest of twigs and dry leaves, built in a twig fork or mistletoe clump, in a tree. 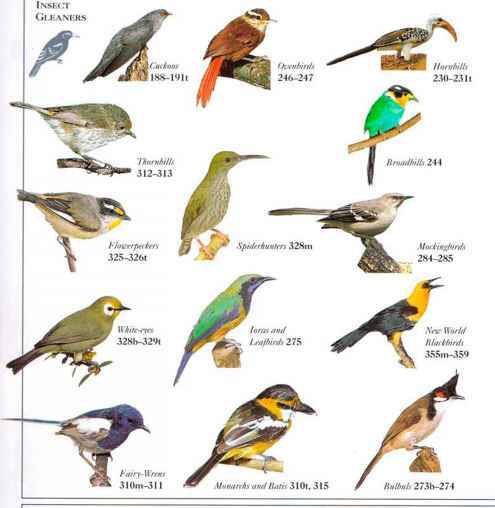 I his bird occurs in dense, dry forest, both in foothills and alongside creeks, feeding on insects, seeds, and berries. 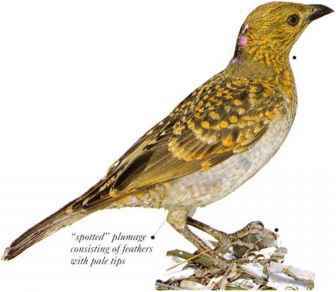 Its name refers to the bowers built by the males to court the females. In this species the bower is a short avenue of interwoven stems, tinted red with a mixture of grass juice and saliva. Each end is ornamented with white or green objects -bones, stones, snail shells, and even glass. Males arc polygamous, and the builder attracts females by a display of his bright magenta nape patch, accompanied by a variety of hissing and chirring sounds. NEST A loose saucer of twigs and stems, on a horizontal branch or among mistletoe in a tree.